We are here to help! You will find most commonly asked questions in the list below. What if the list did not solve my questions? No worries, click the button and send us your questions - We give you an answer! + Do you provide safari service to Kakslauttanen Arctic Resort? Husky & Co. have been several years working closely with Kakslauttanen Arctic Resort. However, by years Our company developes customer service on our own path, and would like to focus more on personal touch. We are no longer the priority company that Kakslauttanen Arctic Resort work with. 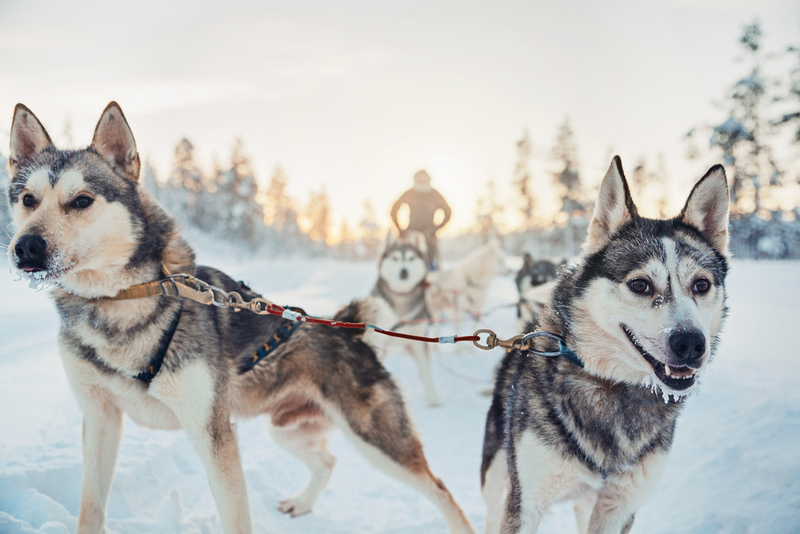 Kakslauttanen Arctic Resort provides activities via following companies: Kamisak Husky Farm, Slominski Husky Farm, and Reindeertravels. + I stay at Kakslauttanen Arctic Resort during my holiday, how do I organise my safari trip with you? Since we are no longer their priority acitvity supplier, we welcome all customers to join our safari. As strict policy applies when customers staying at Kakslauttanen resort, you are required to book all your activities via their reception or sales office. When you wish to enjoy your holiday and safari with us, please contact us via e-mail to husky@huskyco.fi, we will try our best to help you out and provide more information. We recommend to book in advance in order to ensure you have safaris in your convenient schedule, especially in high season it might be fully booked when you inquire on spot. You are welcome to book directly from our webshop or sending us inquiry via e-mail. Cancellation policy is 24 hours before activity departure. Less than 24 hours or no show 100% of total amount. + Do you have husky puppies? Husky puppies is subject to availability, sometimes we do, and sometimes we don´t, because we only breed the dogs when there is a need in kennel. Our kennel is preventing unwanted pregnancy, thus we do not guarantee there are puppies available whole year round. + Can I pet your huskies? You are of course welcome to pet all our huskies, they are trained and very friendly to people. But remember they are still animals, it is not easy to predict their reactions. + What is your group size? Our goupd size depends on bookings. During high season Husky/Snowmobile Safari is around 30-35 people per group. + What language do your guides speak? Our guidance is in English, and customers are responsible to know basic English in order to understand instructions. This concerns for customers safety,as communication is important when emergency happens. If guests do not speak or understand English at all, our guide is the last person to decide weather its safe for the customers to participate in Safari. + what kind of lunch you offer, what if I am vegetarian? Our lunch offers hot soup with bread, coffee/tea and small snacks (usually buns or cookies), if you have food allergy or special diet, please let us know in advance. + How fast we can drive on snowmobile safaris? Snowmobile has offical speed limit, with traffic signs tracks is 60km/h, on ice covered water area is 80km/h, and snowmobile with sledges is 40km/h. Driving speed also depends on whole groups driving skills and tracks conditions. Your safety is very important on our guided safari. + Do you offer pick up service? Our sales office located in the middle of Saariselkä center, closed to all hotels, main departure is from our sales office (address: Saariseläntie 10, 99830 Saariselkä). If your accommodation are not in town (walking distance more than 1km), for example Kuukkeli Apartment Aurora, Nothern Light Village, Star Arctic Hotel, Muotka Wilderness hotel, Kiilopää fell center, and Polar Aurora Cabin .. and so on. Please contact us, we will agree a seperate pick up place and time in advance. + When do I pay my safaris? All safari payment need to be settled 1 day before your activity at our sales office, or on spot when you make a booking via our webshop. We accept credit cards and cash. + Do you provide extra clothing? What should I prepare on my own? Most of our winter safaris include thermal overalls, woolen socks, winter boots, balaclava, gloves and hats (also helmets in snowmobile Safari). Therefore, we recommend to take basic thermal layers, When it is very cold outside (eg. -20C), it is better to keep your own jackets and pants on and putting bigger overalls on top of it. + Is there age limit for children to join safaris? We welcome all children to our safaris, however children under 4 years old must consider the extreme weater condition in Lapland, also if they can stay calm in the moving sleigh. Children should share same sledge with parents. + I am afraid to drive, what can I do? You can inquire our guides to be your driver. Guides driving supplement charge is 100€ per guide, please contact us and book in advance. + I would prefer a private safari, how much would it cost? Private safari supplement is 300€ per group per safari (Jan - Apr). We are able to offer private safari after 6th January. + Do you guarantee to see northern lights? Do I get refund or join other trip if it doesn´t show? Northern light is a natural phenomenon, unfortunately we are not able to predict. The best time to see the northern lights is when the sky is clear from clouds. some people also said that aurora comes out when temperatures are colder. It needs all factors matach, the most important is that it requires a lot of luck from you. Our guides will do their best leading you to chase Aurora, so there is no refund in this case.